As promised, the Republicans in the Iowa House last week announced they were planning to unveil a bipartisan gas tax hike bill. While that bill has not yet materialized, another House Republican has put up a plan for a phased-in, six-cent increase in Iowa’s motor fuel taxes. House File 144, offered yesterday by state Rep. Ron Jorgensen (R-Sioux City), isn’t the 10-cent increase that has been discussed in the past. However, it not only increases the motor fuel tax rates, but also reprioritizes spending in the Road Use Tax Fund. First, the bill increases motor fuel taxes by three cents effective July 1 of this year, and by another three cents effective July 1, 2016. It also pushes back the sunset date on the differential on ethanol and non-ethanol motor fuels, which was supposed to end June 30 of this year. HF 144 differs significantly from the other gas tax bill already filed in the House. In that bill, the mode of taxation would change from a per-gallon to a percentage of purchase price basis, which could lead to increases anytime the price of gas increases. That bill, HF 83, remains stuck in committee at this point. HF 144 would also reprioritize wagering tax receipts beginning July 1 of this year, so that the first $50 million would be deposited into the Road Use Tax Fund. Those deposits would take priority over deposits into the state’s Revenue Bond Debt Service Fund, the Revenue Bond Federal Subsidy Holdback Fund, the Vision Iowa Fund, the Iowa Skilled Worker and Job Creation fund, and the Rebuild Iowa Infrastructure Fund. The bill would also require that 50 percent of the revenue generated from red light cameras and automated speed enforcement cameras be deposited in the Road Use Tax Fund. The cost of operation of the systems must first be deducted, and half of the remainder would go into the Road Use Tax Fund. HF 144 would require the Iowa Department of Transportation Highways Administrator to prioritize the completion of in-progress highway construction and maintenance projects before new projects can begin. It also requires IDOT to find ways to save $50 million on department operations. The bill has received a lukewarm response from lobbyists, so far. But grassroots conservatives across the state are strongly opposed to the proposed legislation – or any legislation that raises the gas taxes in Iowa. Americans For Prosperity has long opposed an increase in the gas tax in Iowa. It recently re-launched its anti-gas tax campaign website and has been producing mailers and pamphlets in opposition to any increase in motor fuel excise taxes. Iowans For Tax Relief has made opposition to a gas tax increase it’s highest priority this session. It commissioned a poll conducted by Victory Enterprises of Davenport one month ago that showed – within a margin of error of 4.89 percent – that 77.7 percent of Iowans oppose a 10-cent increase in the motor fuel tax. That same poll found 66.3 percent of Iowans believe the state has enough money to fix and maintain roads and bridges, but that smarter spending and better prioritization were needed, rather than tax hikes. It also found 63.7 percent of Iowans want legislators to find alternatives to raising the gas tax by any amount. In December, the Johnson County Republican Party Central Committee approved a resolution rejecting an increase in the state fuel tax. The full text of that resolution can be read by clicking here. 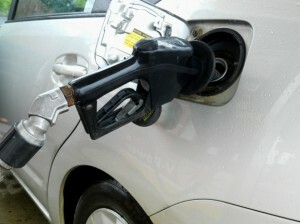 Monday night, the Madison County Republican Party Central Committee also approved a resolution rejecting an increase in the gas tax. The resolution was offered by county co-chair Heather Stancil. 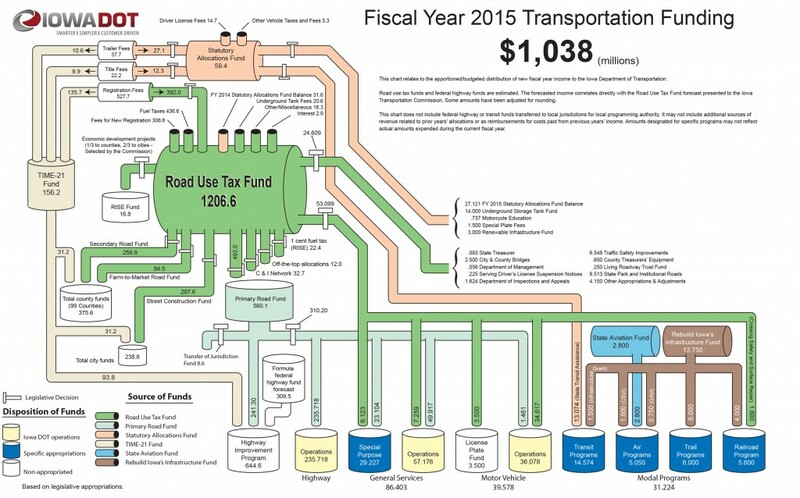 The graphic above (click it to see it in full size) shows where and how the Iowa Department of Transportation is funded, the bulk of which comes from the Road Use Tax Fund. It also shows expenditures out of each of the funds, although not to specific projects. To see specific projects currently on IDOT’s five-year program, click on this link. Another major factor that will likely impact highway construction funding in the near-term is the federal Highway Trust Fund, which is structurally insolvent. Transfers from the federal government’s General Fund to HTF are a stopgap to keep the fund from being completely drained. Congressional Republicans – with pressure from the U.S. Chamber of Commerce – have begun proposing gas tax increases to address the HTF’s insolvency. But, as with Iowa, there is little public support for a federal gas tax increase nationally.